For sure you have heard of spaces that made use of transforming furniture. There are also some homes that feature spaces which has multiple usage simply by switching a wall or a furniture. But this is actually possible! In fact, this is commonly used in apartments with small floor areas. We have featured homes like this in the past. And today, we have another impressive apartment which made use of its space in a good manner. 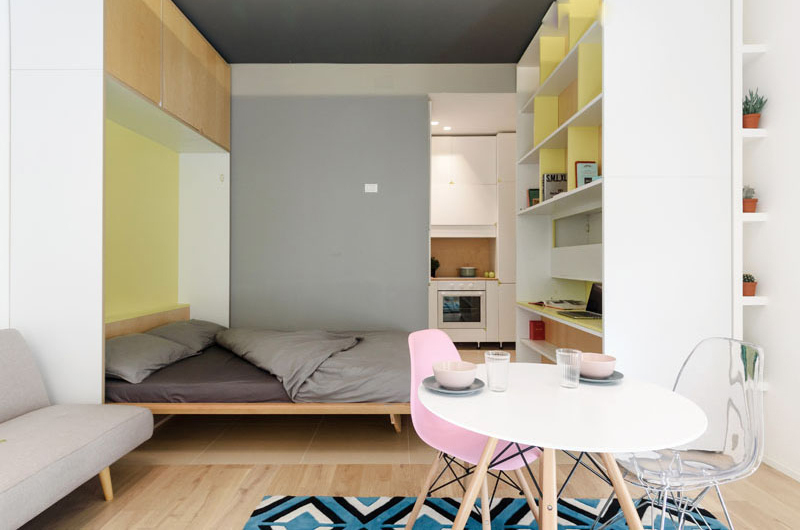 After seeing this, it will change your mind about living in a small space. Most of us think that a small home won’t be comfortable and it cannot contain everything that we need. But you are totally wrong! 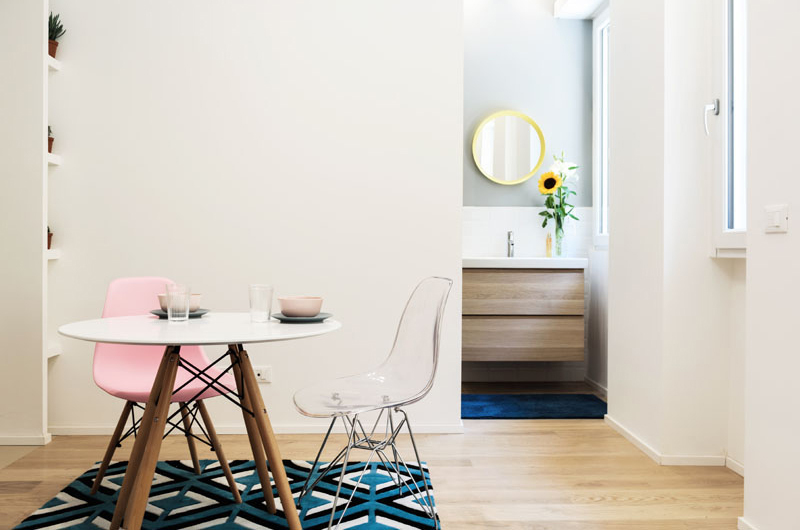 The apartment that we will show you today features a small bathroom, which divides a small room that is used as a kitchen with the rest of the space left to open space. The home has everything in the same space simply by transforming the walls. Take a look at the home below and it will no doubt blow your mind! 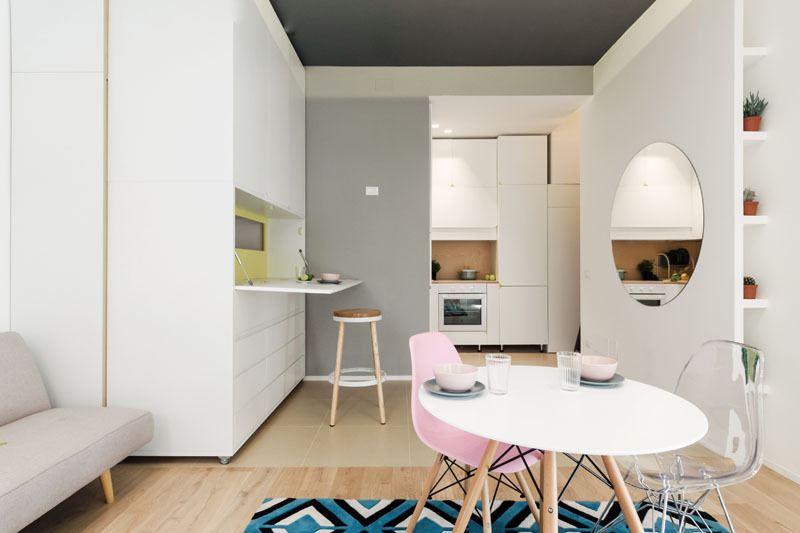 Unique feature: This small apartment has everything one needs for a home with so many space saving features. 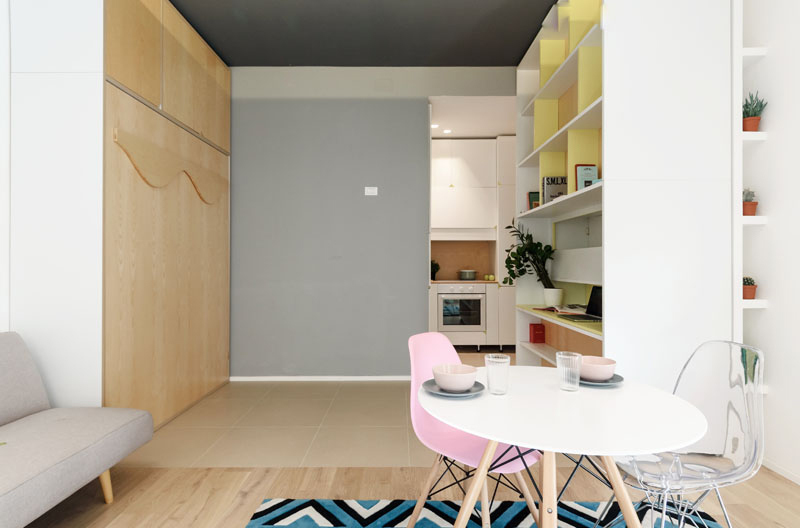 The micro-apartment only has 317 square foot (29.5 sqm) floor area. It has a beautiful modern interior design and it is located in Milan, Italy. As you can see in the image above, it features a movable wall with a variety of usage. You can see that the apartment has a sliding wall that leads to a kitchen. Aside from the dining space, there is also another built-in table on one side of the wall. There’s more storage on that side while on the opposite wall, there is a mirror that makes the apartment feel larger. Next to the living room is the movable wall. When it is positioned in the center, one can use a down desk on one side. On the other side is a fold-down table that we have seen in the image above. On the desk side, there’s open shelving for extra storage. 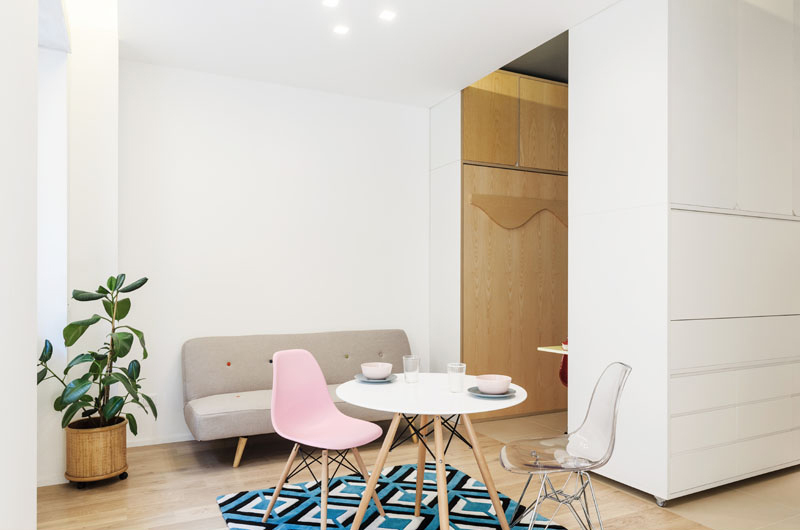 The space has some pastel color touches just like the pink chair in here which is paired with a transparent chair of the same design. The area rug under it adds color and appeal to the space. It also breaks the white colors all around the apartment. In this image, you can also see a powder room which we assume leads to a bathroom. Another look at the small and simple living area with movable walls on the side. Despite being small, it has a beautiful design and it is very functional. Here is a look at the office/working area of the house. Isn’t it cool? Totally! Apart from the down table, it also has open shelves where they can store books and other items. It is also nice that it used pastel yellow in it. 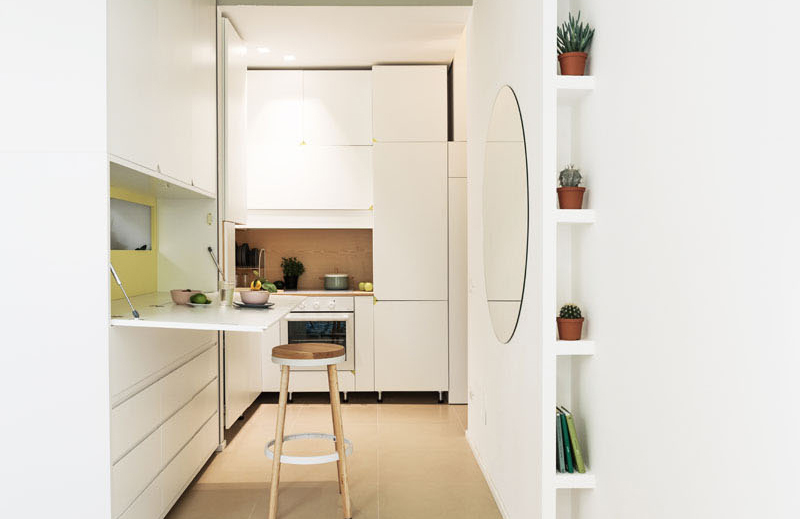 The movable wall can also sit flush with the cabinets in the tiny kitchen. Yup, it can totally connect to the kitchen which makes the space appear larger. 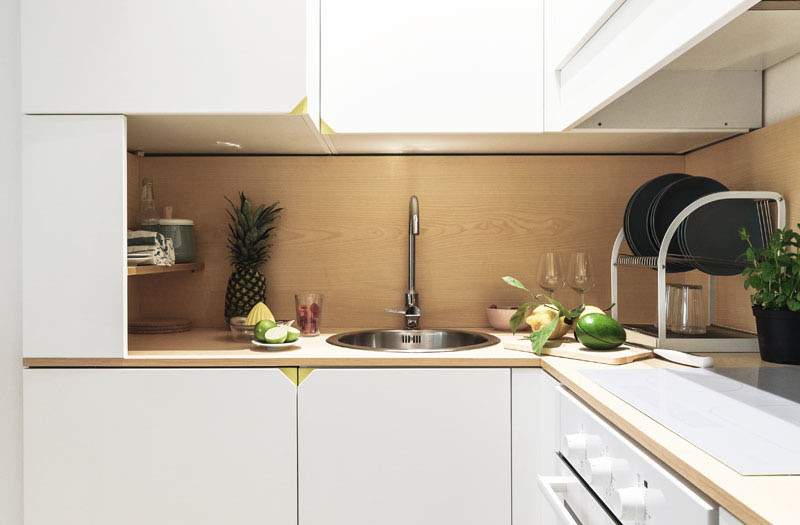 You can see here the fold-down table that can become additional counter space for food preparation. It is a nice idea to add plants in the space like what you can see here. 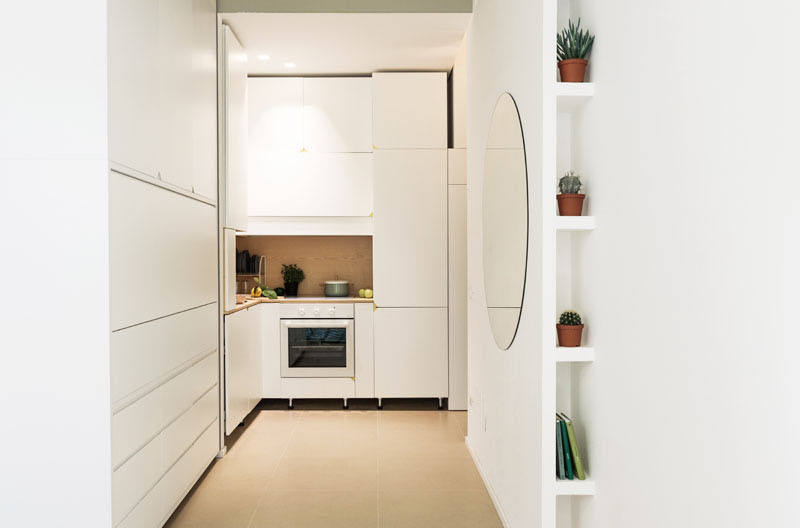 The kitchen features a combination of wood and white colors. You can also see that there is a small indentation on the doors with yellow colors. Isn’t that cute? So, where is the sleeping area? You are looking at the apartment’s bedroom. Remember that office space? By pushing it farther to the end, it provides enough space that will fit a bed. You can see the murphy bed here which was taken down from the wall. Very impressive indeed! 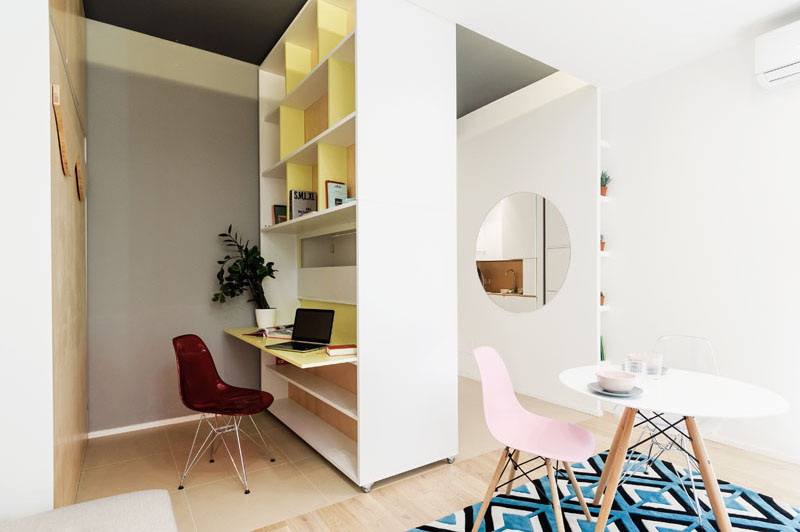 Who would think that a movable wall can provide a micro-apartment every single space they need? What can you say about this apartment? Isn’t it impressive? It looks really cool, right? Obviously, architecture firm PLANAIR did their best to plan this space. It takes proper planning to achieve a space like the one above. It is indeed amazing that a small space can actually contain everything one needs for a home. 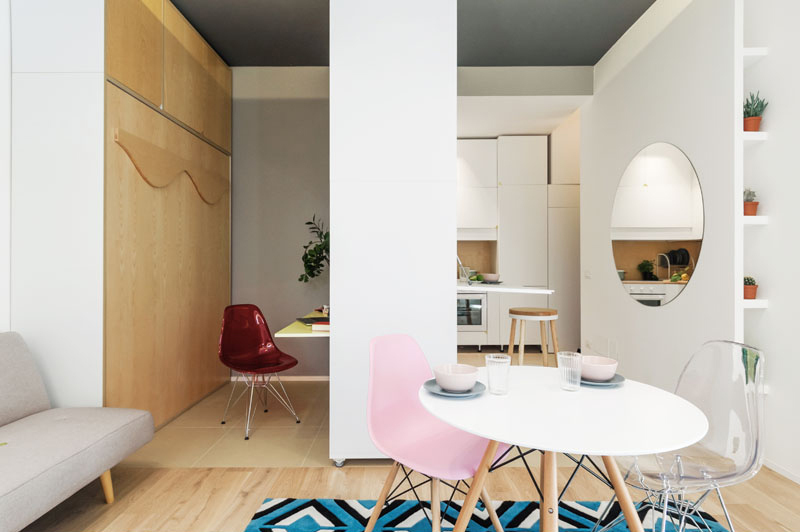 Notice that the living area, kitchen, and bedroom are all in the same space which is achieved by transforming the wall. Aside from that, the apartment has a very nice interior design which makes it even more impressive.